The kitchen is the heart of the home, where family comes together. With the right organization, it can also be a relaxing and motivating space to explore your creativity and entertain your loved ones. A disorganized kitchen can quickly become a stressful work environment. Even the most neat and tidy of us fall into messy habits like pushing food toward the back of the cupboards, over-buying what we already have, and allowing spills and dust to gather in the dark corners of our pantries. 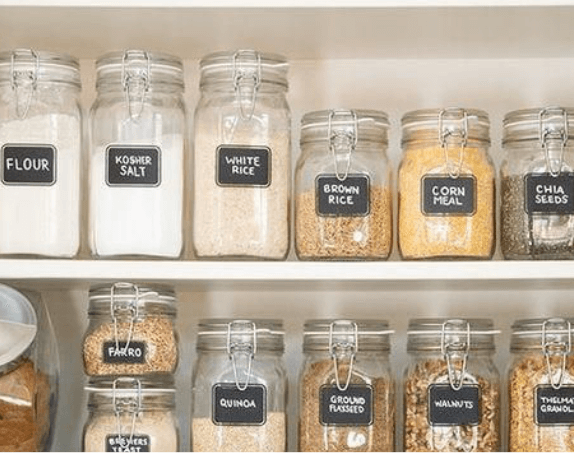 If you find that your pantry is becoming overwhelming to keep clean, here are 4 simple steps to get you back in control. In order to know what kind of storage options you will need, take note of what you already have. To do this, you should first empty everything out. Make sure you have a few nearby surfaces cleared off where you can set things. You may find some things that have migrated into your pantry that don’t belong. Once your pantry is empty, you have the opportunity to give all your shelves a proper wipe down. This is also a great time to readjust the height of shelves, if necessary. Now that you have everything set out, begin to divide everything into separate areas. Some easy sections that may apply to your pantry are the following: dried goods such as rice and pasta, canned foods, breads, baking ingredients, snacks, cereals, condiments, seasonings, and cleaning supplies. Once you have everything divided up, you will be able to see what you have the most of and what needs a better storage system. It may be best to place things that you use most frequently closest at hand. The largest and heavier items can go near the bottom of your pantry, and items you use seasonally can be stored up and out of the way. Perhaps in your home you use a lot of dried goods, which would be aesthetically pleasing, and less likely to spill if stored in upright jars. Maybe you have a lot of spices in similar looking containers. These would be easier to differentiate if they were set up on a spice shelf and labeled. A great way to go the extra mile in organizing is by adding labels onto your containers. Sticker chalk labels are a practical way to create reusable jars for different kinds of foods later on. You can also use a label maker to tag storage bins and shelves. This will help you and the rest of your family to easily find things, and to keep everything in its designated place. These easy steps should hopefully give you a great start to further clean up your space. Happy organizing!